While human-animal interaction with horses has been shown to improve social competence, self-esteem, confidence and behavior in youth, there are no existing equine education programs in the Bay Area that teach students horsemanship and provide academic credit for doing so. 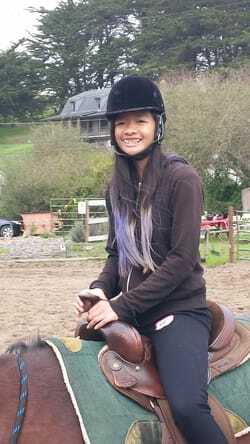 City Horse has developed an innovative equine education program for urban, at-risk students who are grossly under represented youth in the world of horses throughout the Bay Area. City Horse connects middle and high school students with local horse stables to get students out of the traditional classroom and onto a rural, ranch setting. Students learn horsemanship, grooming, nutrition, barn management and life skills while receiving academic credit toward graduation. City Horse is a fiscally sponsored not-for-profit program of 501 (c)3 Empowerment Works, Inc.
City Horse serves students who would not otherwise have a chance to experience life on a ranch. City Horse offers field trips to local horse stables for under represented students of color throughout the Bay Area. Field trips are a great way to introduce students and schools to the City Horse program and find out what we do. Field trips are offered year a round regardless of weather. Students will leave the stable with a real sense of what it's like to own a horse and run a horse business. City Horse partners schools and students with local horse stables that have the experience, knowledge and desire to work with our students. Our goal is to create a partnership between school and stable that will make a lasting impact on the lives of each student. Our students are struggling to make the grades, stay focused in school and handle the pressures in their community and family life. The City Horse program raises money for students who are attending under-performing and under-funded schools to get outside of the traditional classroom and onto a working horse ranch to learn about horses. Our program is ideal for students attending alternative education or continuation schools; Independent study programs, community schools and group home facilitated education. Our goal is to provide students a chance to learn valuable horse skills, reflect on their lives and experience school, nature and education in a completely different way. Too many students of color in our inner cities have little opportunity to get out into nature and onto a working horse ranch. The City Horse after-school network provides students extra curricular activities that go beyond our stable classroom. Students who participate in the CIty Horse program are encouraged to participate in partner programs also focused on horsemanship, livestock and small animals; such as 4-H, English and Western riding clubs and youth horse associations. The City Horse After-School network is set-up to make sure our students get the out of class stimulation they need to be their best inside the classroom.